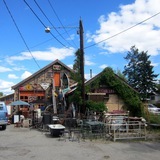 If you're looking for that perfect retro piece to complete your décor, or you just love getting lost among haphazard stacks of vintage treasures, Lois Lane Warehouse is a wonderful resource tucked away in the industrial area of downtown Kelowna. At first you will be overwhelmed walking up to the converted barn, as there will be no shortage of things to look at - big or small. But once your eyes begin to dig through the piles (because physically moving anything is next to impossible), you're bound to find something quirky or interesting. Among the piles are old furniture pieces, metal frames, vintage lamps, tables and chairs, picture frames, tea sets, and so much more. Towards the back they even have collections of table legs and fabrics so you can create your own perfect piece - or ask them to do it for you. Unfortunately, as enchanting as everything may be, beware that there are no prices on anything and when you inquire, you may not be happy with the answer. Despite appearances, you are not walking into a treasure trove of undiscovered vintage finds. Everything has already been "picked," and the boutique prices certainly reflect that. You may have a little luck with bargaining, but don't put too much hope in getting a good deal at Lois Lane. Otherwise, it's a fabulous little spot that will occupy you for hours as you sift through all the beautiful pieces, trinkets, and bits of history.